The air pump reduces emissions when the engine is below 3800 rpm. Above 3800 rpm the main cat is hot enough without the extra air. The air pump pumps air into the exhaust and into the main cat to give extra oxygen for the pollutants to combine with and burn. To disable it just disconnect the gray plastic electrical connector on the top of the pump. You wont be able to pass an emission test with it off though (you can always plug it back in for the test). It is possible that disabling the air pump with the main catalytic converter still installed could cause the cat to run so cool that it may get coated by unburned oil from the oil injection pump. No one is sure about this though. This mod is for off road use (racing) only, it is not legal for public highway use vehicles. You won't gain much from this mod because the air pump's clutch is disengaged under full throttle and it takes very little power to spin the pumps pulley when the clutch is disengaged. But if you already have the main catalytic converter out you might as well pull the pump and save the nine pounds of weight. The toughest thing about eliminating the air pump is finding a short belt to replace the long one that spins the air pump, water pump and alternator. Tom Jelly uses a 4 rib, 300mm Goodyear belt. GReddy sells a pulley kit that uses a larger water pump and alternator pulley (which under-drives them-which is good) which allows you to use a v-belt in a readily available size. Start the air pump removal by removing the air conditioner & power steering belt. This belt has to be removed because the air pump belt is inside the air conditioning belt. There's a tension adjuster that will allow you to loosen the air conditioning belt. 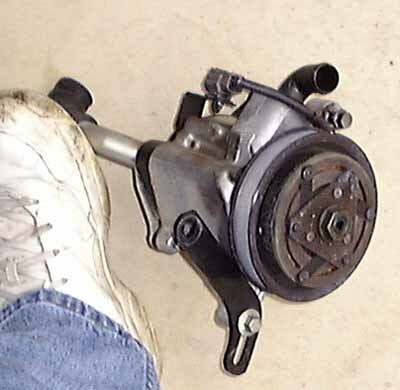 Then loosen the alternator bolts and loosen the alternator belt tension adjuster to remove the air pump belt. Install the after market water pump and alternator pulleys following their instructions. You will need an air impact wrench to remove and install the alternator pulley nut, it's the only way you can get the pulley lose--trust me. Disconnect the air pump electrical connector (clutch control) located on top of the air pump. The air pump is held in place with three bolts. One on top one on the water pump side down low (and hard to get to) and one on an adjuster bracket on the air box side. Remove the bolts and then pull back the air pump air pipe clamps and pull them loose and remove the air pump. I plugged the air pump air pipe connections with 3/4 inch rubber plugs I got from the local auto parts store.